Owen’s birthday was last week and I have yet to share his birthday cake with you all. I love making fun birthday cakes for my kids and my kids really look forward to planning out their cake each year. For his 6th birthday, Owen decided he wanted a dinosaur birthday party. He and I sat down and scrolled through Pinterest together to find the perfect dinosaur birthday cake. Owen picked out a few options, kept changing his mind about which cake he wanted, and then learned about chocolate candy that looks like rocks. 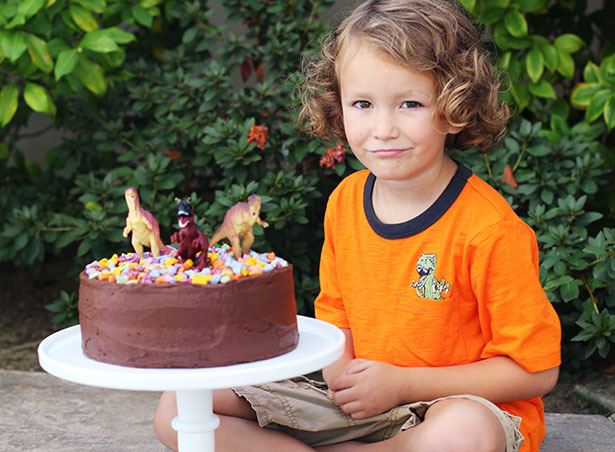 Once he knew that candy existed he was hooked on making what turned out to be the easiest dinosaur birthday cake ever. Thanks, Owen! 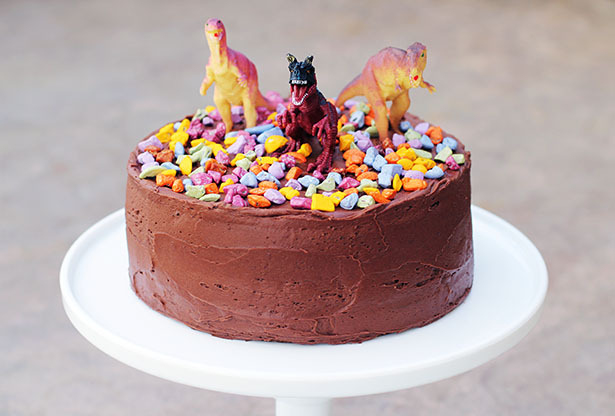 So, how do you make the easiest dinosaur birthday cake ever? Make a 2-layer round cake. Frost with chocolate frosting. Be generous with the frosting, especially on the top as those dinosaurs need a nice layer of mud to sink their feet into so they can stay standing! Place said candy on top of the cake. YOU ARE DONE. You’re welcome. I used Matthew Mead’s chocolate cake recipe, which you can find at the end of this blog post. I made a chocolate buttercream frosting for the outside of the cake – recipe below! Click here for the the inspiration for this cake! 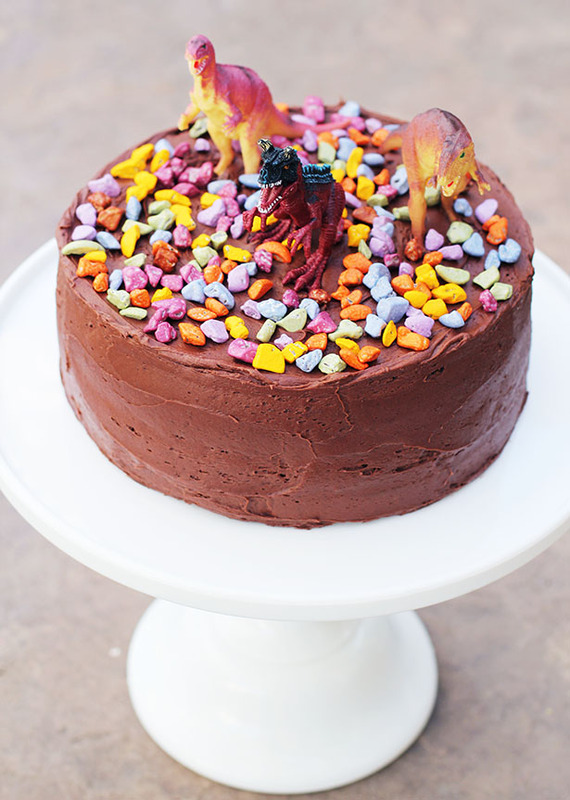 Click here for the other easy dinosaur birthday cake idea (hello, cutest fossils ever) that I was totally trying to get Owen to choose. I had him convinced for about 2 hours, but then that rock candy ruined everything. Except it didn’t because Owen’s cake was super awesome. That’s Owen’s “I knew the rock candy cake would be as cute as the fossil cake, Mom” face. Here is how I made the chocolate buttercream frosting. Once again, people who usually do not like cake loved my cake. These recipes are winners. Also, use HIGH QUALITY cocoa powder. I’m telling you it makes a difference. Promise. Beat butter with a mixer (I use my KitchenAid with the paddle attachment). Gradually work in the powdered sugar, alternating with the milk/cream and beating well after each addition. I put a range for the powdered sugar and milk/cream measurements. Start with 6 cups and 6 tablespoons each, then add more powdered sugar if the frosting is too thin, or more milk/cream if it is too thick. Frosting should be a spreading consistency that still holds its shape. This makes enough frosting for a 2-layer 8- or 9-inch cake, with a little leftover. This is cute, sounds delicious and seems to be pretty foolproof!